A fascinating and at times heart-rending account of one of the biggest Allied disasters of WWII, written by a man who understands war (John Nichol was one of the pilot prisoners of war paraded before the TV cameras by Saddam Hussein in the first Gulf War). I couldn't put this book down. Gripping read about awesome stamina and bravery, full of horrific detail, but the last chapter is the best. It tells how the media and politicians made a defeat appear like a victory and how the most brainy (but ignored) of the military commanders, involved in the operation, was fired because a scapegoat was needed to cover incompetence of others. Chops & changes in its chronology a little too much but it is greatly enriched by its use of first hand accounts - especially of the Dutch civilians trapped inside Arnhem and Oosterbeek. Beautiful. Heartbreaking. Unique insight into the horrors and heroes of war. Read this a while ago and after a difficult start I got into it and finished it fairly soon after. There have been many books about this blighted operation. This one offers a good balance of coverage of the participants so the authors are to be commended for having acquired them for posterity. Not sure it makes for easy reading as anyone familiar with how it turned out will know. But if you want tales of remarkable human courage and fortitude then this is essential. It is curious that this is the time when the term "war criminal" came into use. Usually the term is reserved for the enemy but perhaps for Arnhem we can make an exception. From today's perspective it is hard not to see this action's good intentions as being tainted by other factors. Not least was the determination of certain higher ups to have the glory of being first across the Rhine and then into the heartland of Germany. And never mind what it might take in the lives of our soldiers. Their refusal to heed the warnings of experts of the presence of German units "resting" in the vicinity was akin to a war crime in my book. Montgomery has much to answer for as he was its principal architect. But his superiors are no less guilty in my opinion. They should have reigned in his wilder urges and taken a more cautious approach. How ironic when Monty had been of accused of over-caution in some of his actions in North Africa. Maybe this is why he was so headstrong at Arnhem but his gamble failed and brought disaster to the many under his command and not a few of the Dutch people caught up in this mad episode. A well constructed book of first-hand accounts, telling the tragic story of a hurriedly put together operation. A fascinating insight. I bought it for my dad but have grabbed it back many a time for a read. The end is particularly sad, especially the treatment of the Poles and their general. It wouild be one of my "desert island" books had I time to order any! Excellent book ... not only for a chap, who grew up on Ryan's "A Bridge Too Far" - book and the movie. Painful in it's honesty and accuracy, unbearable at every Polish track.... so even special praise for both authors for presenting them in such amount and detail. Definitely - a class of its own. I've read to much about American soldiers in the war, and this is an excellent report on the British Tommies' experience. Gritty, in-you-face action with heartfelt memories: you can almost taste the dirt, blood and cordite. Very good , they were the bravest of the brave. The Dutch suffered so badly for this parachute drop. alright here goes...I liked it...hard to get into,what I did like was what happened to the town of Arnhem afterwards. 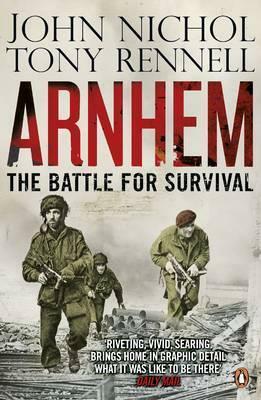 Loved this book, it gives you a real insight into the men and women caught up in the action in and around Arnhem! JohnNichol Tony Rennell - Librarian Note: There is more than one author by this name in the Goodreads database.Flight Lieutenant Adrian John Nichol (born December 1963) is a retired Royal Air Force navigator who was shot down and captured during the first Gulf War.